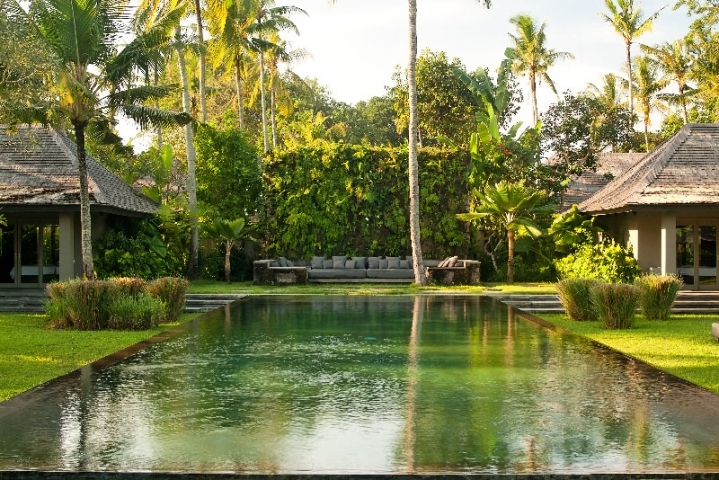 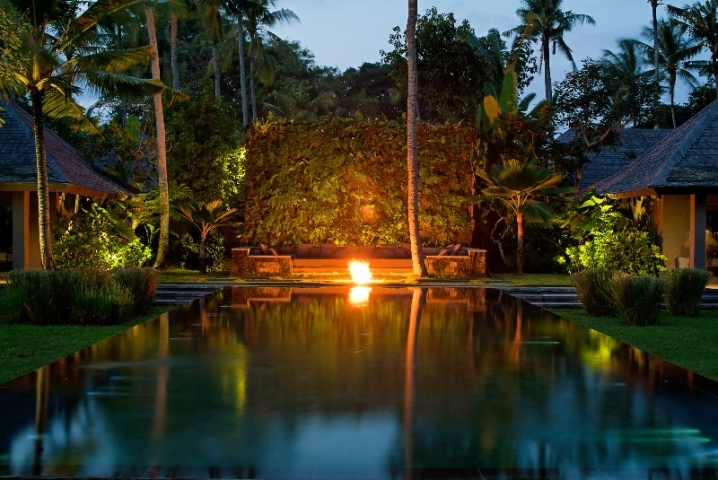 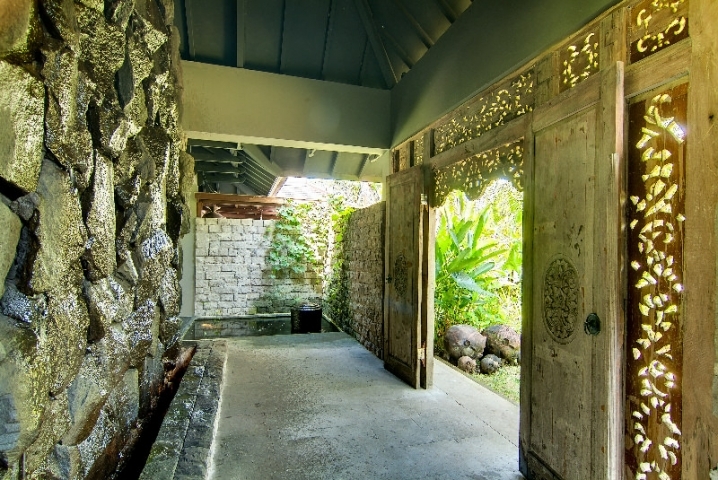 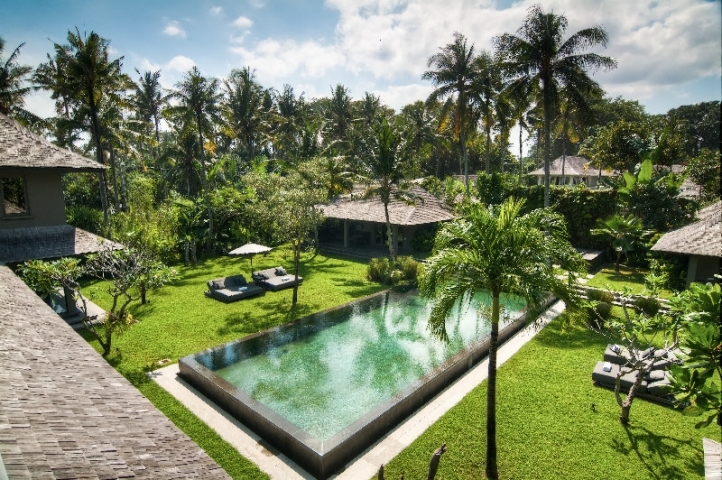 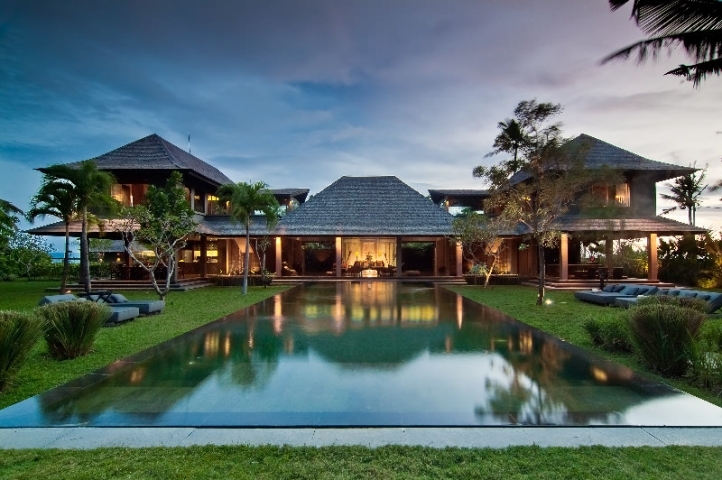 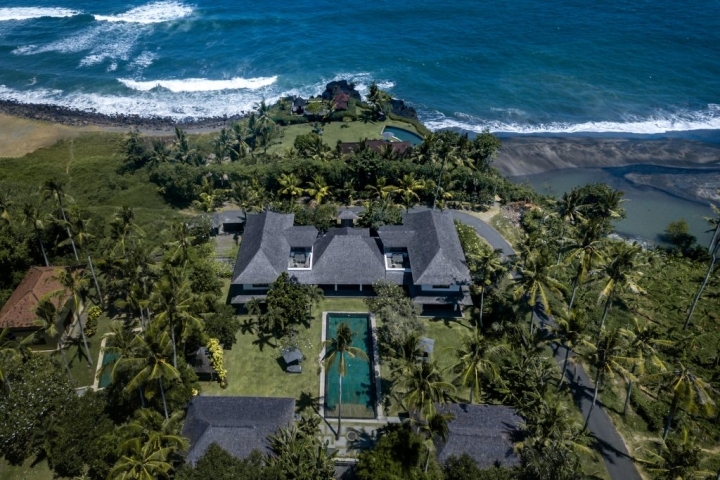 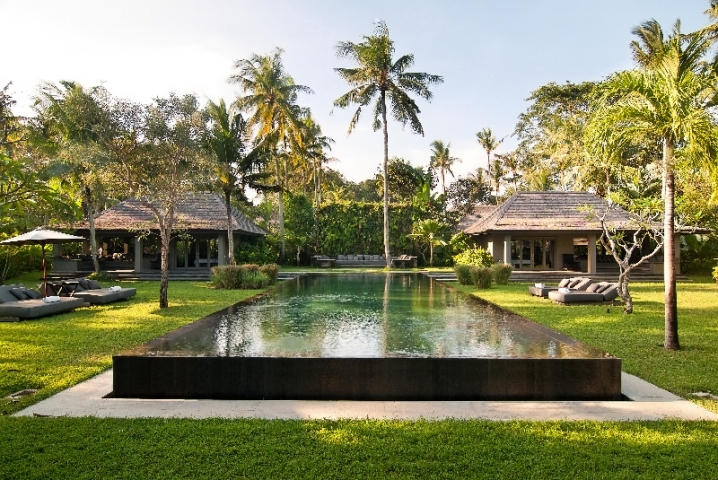 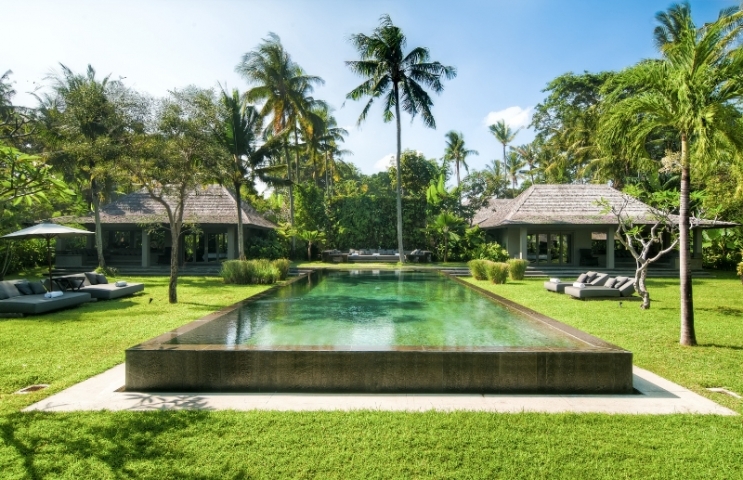 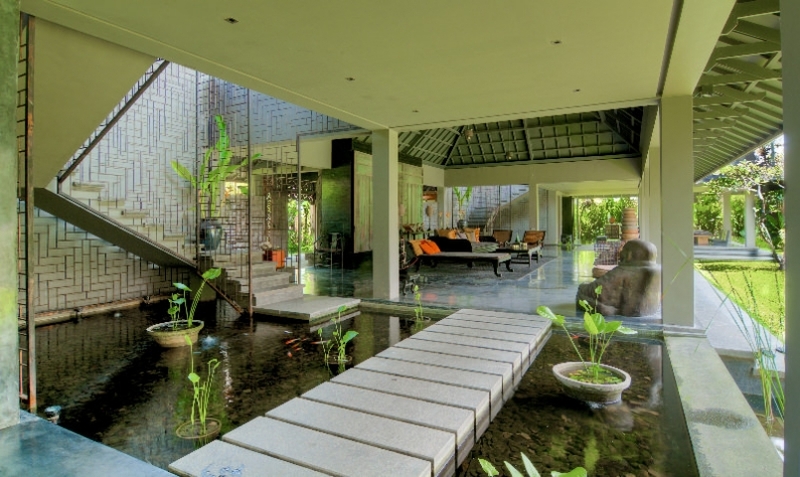 Impressive five-bedroom villa is located in the beautiful and very traditional Balinese village of Seseh, just a stone’s throw from the beach. 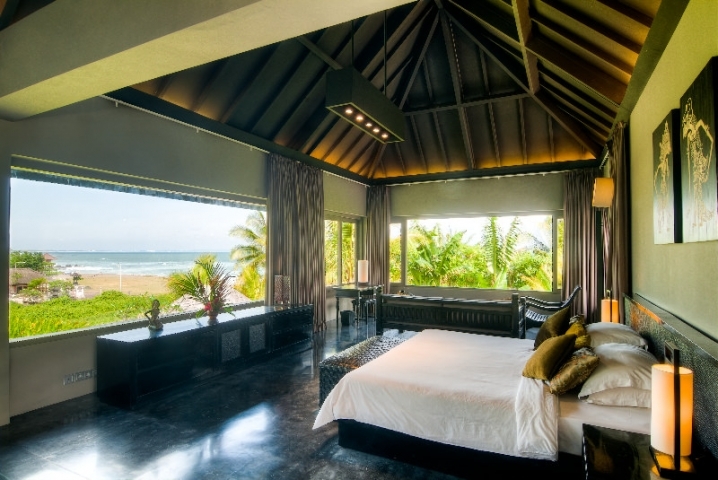 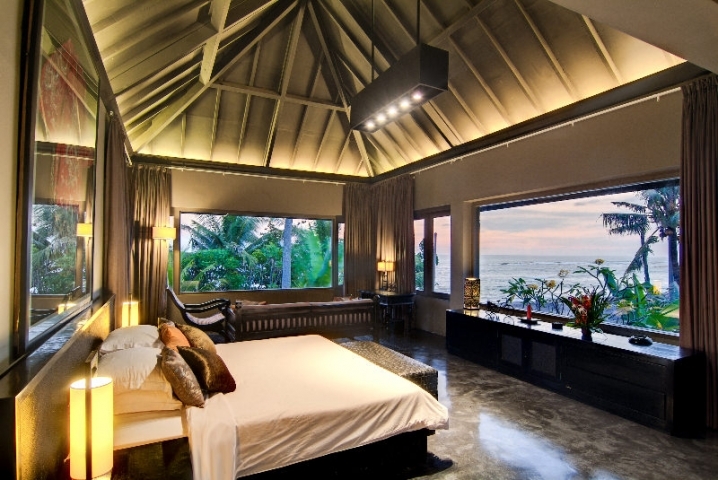 All five bedrooms are furnished with king-size beds, and equipped with ensuite bathrooms and air conditioning. 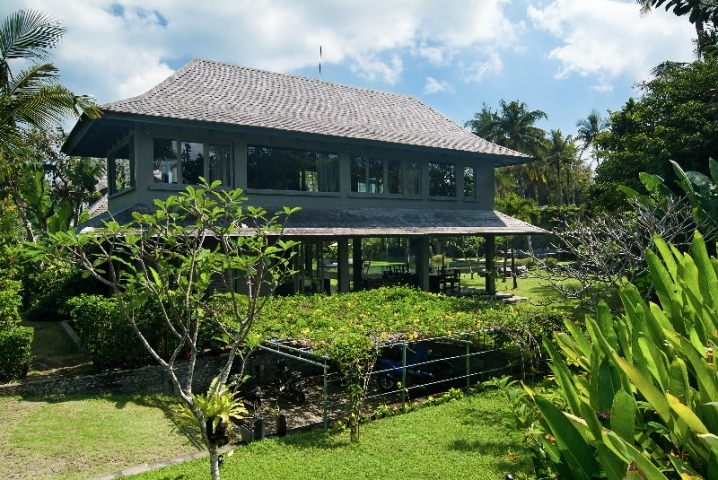 Capacity: 10 people (5 king size beds) plus additional bed/cot available on request for children. 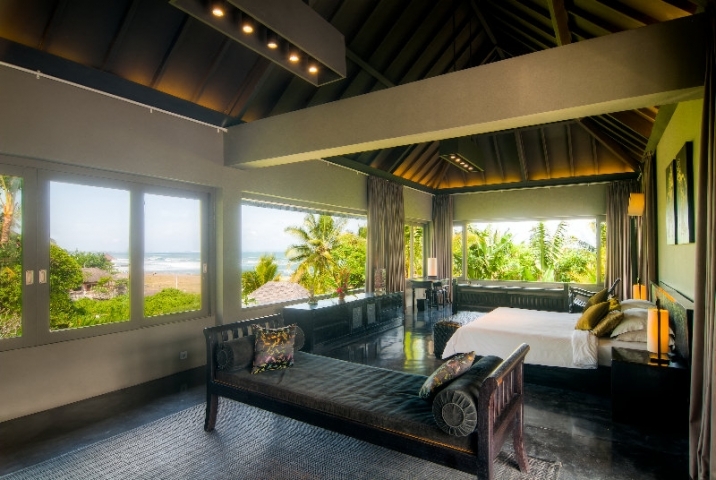 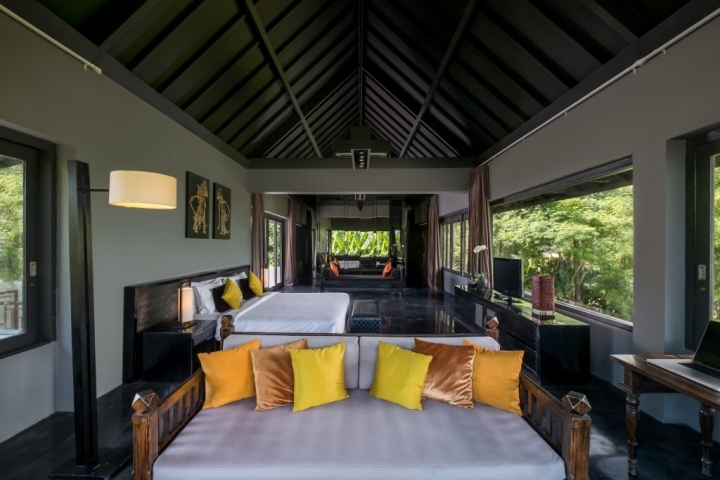 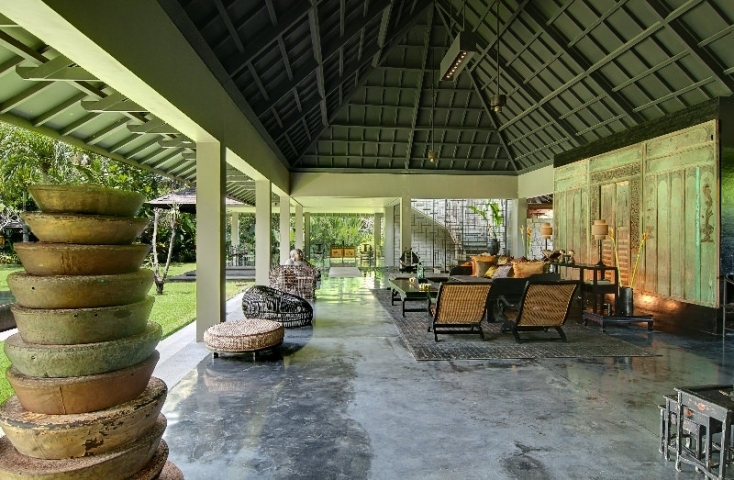 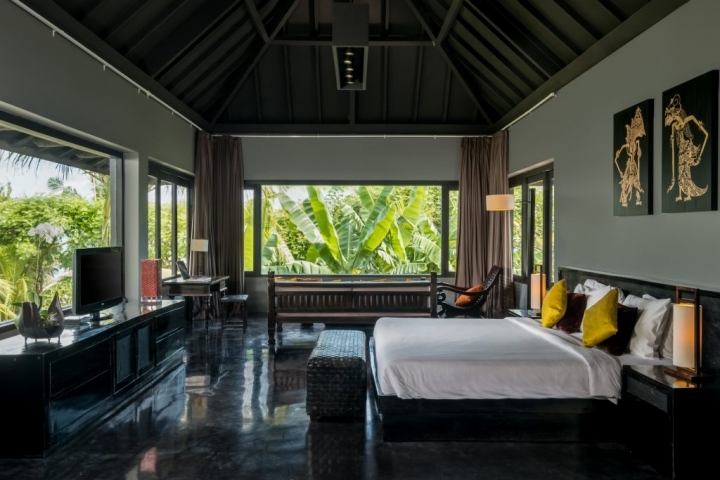 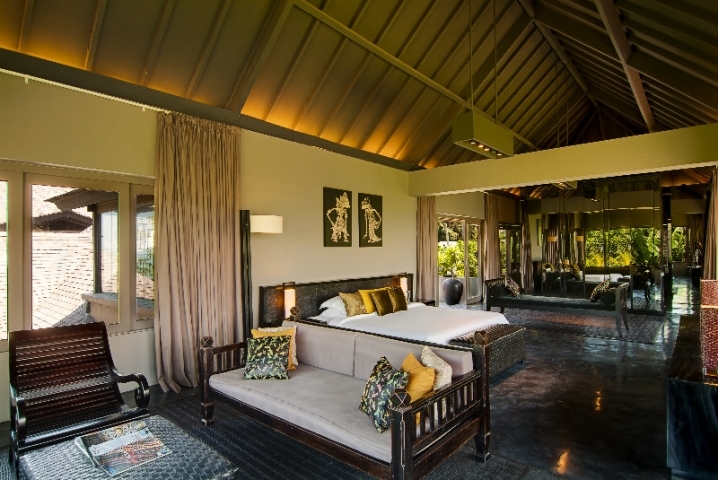 At the heart of Villa's main pavilion is an enormous light-filled, open-plan living room furnished with an oversized daybed strewn with Chinese style silk cushions, and comfortable rattan chairs upon which to recline with a book or take an afternoon nap. 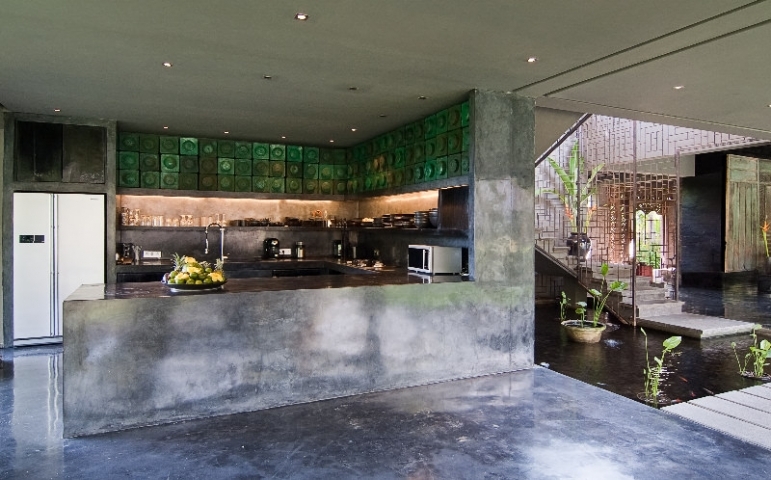 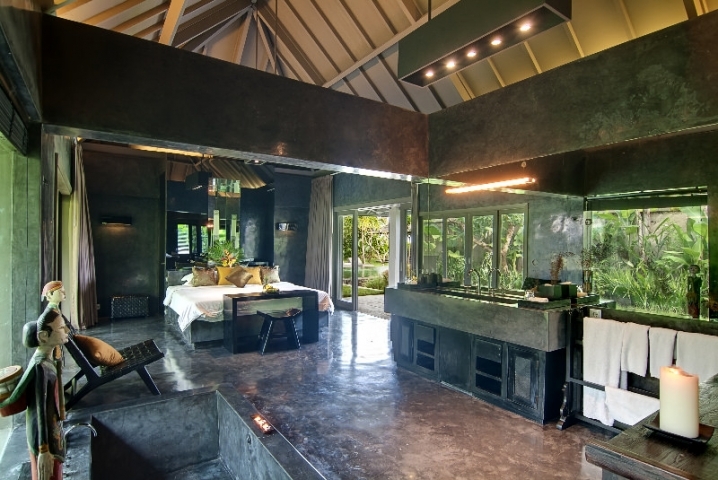 Adjacent to the kitchen, the open-sided dining room seats ten and overlooks the garden, pool and balé. 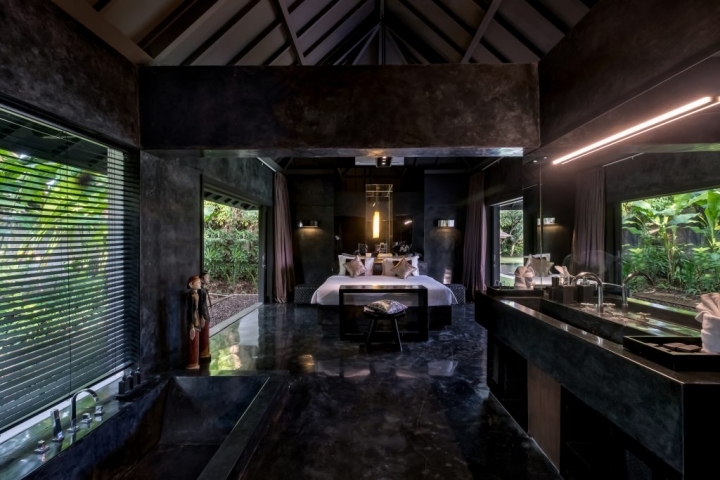 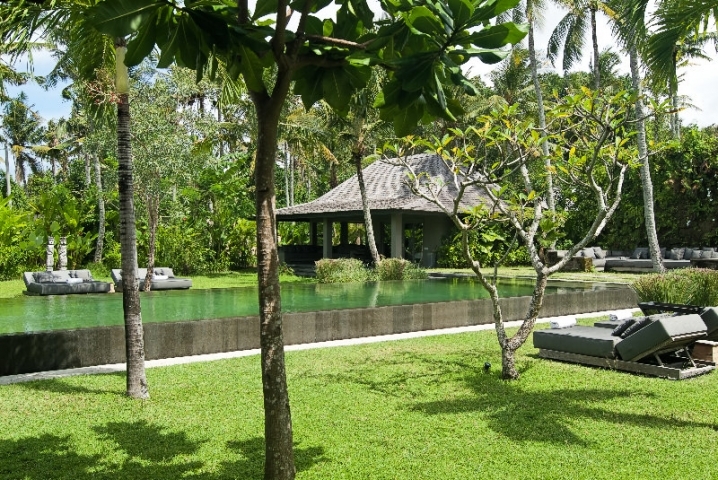 The entertainment area is located to the other side of the living pavilion and is furnished with comfortable sofas on which to lay back and watch the flat-screen television, discreetly housed within a chic black oriental-style cabinet. 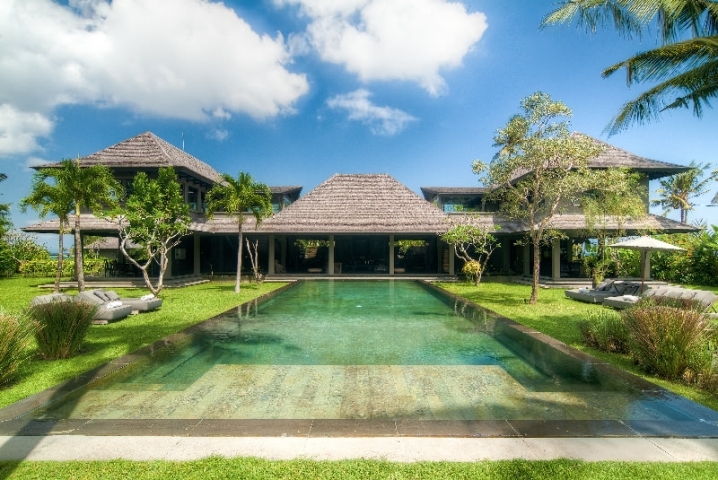 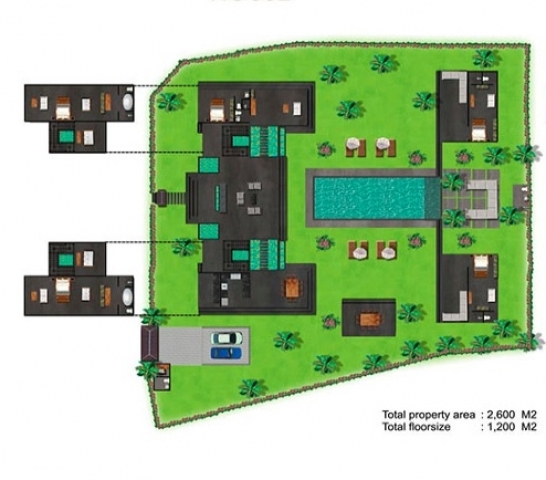 Villa has 18m x 16.4m private swimming pool. 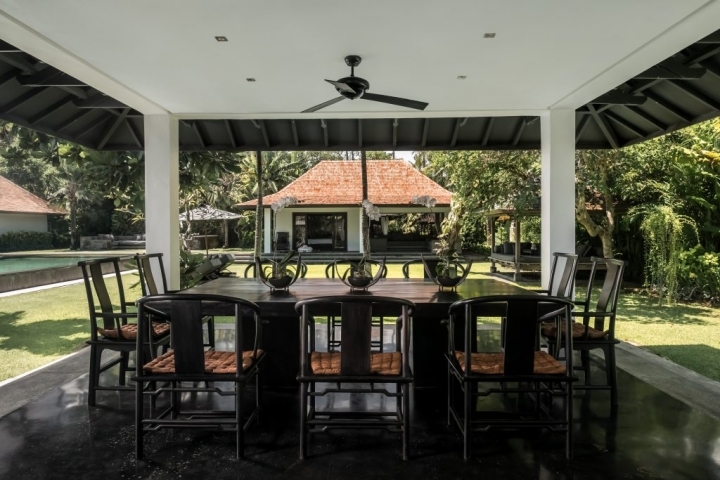 Impeccably trained staff, including an experienced villa manager and restaurant-trained private chef, will ensure that every moment of your stay is absolutely faultless. 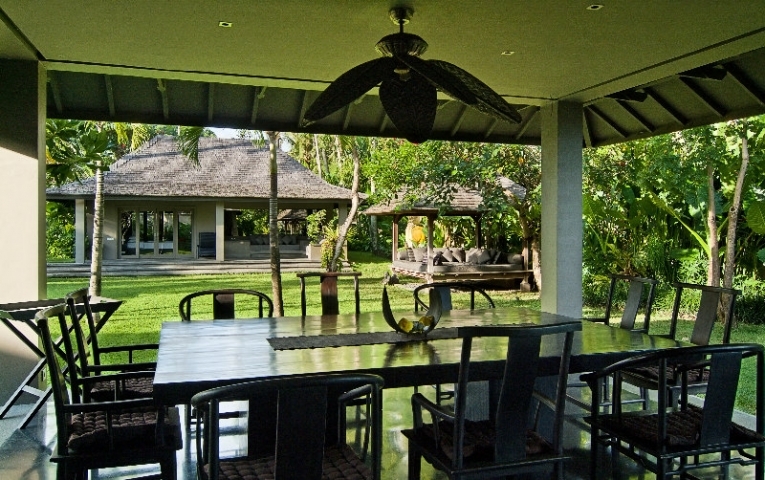 Groceries bills + 15% service charge for food and beverage. 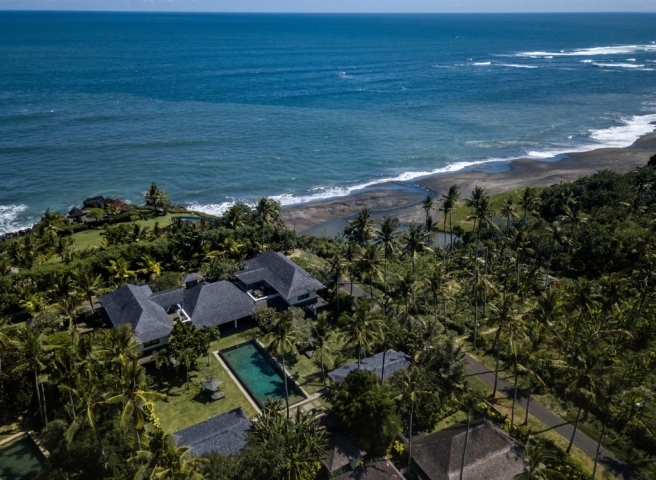 Only a few metres from the villa lies Seseh’s glistening volcanic-sand beach, where surf beckons and rock pools fascinate. 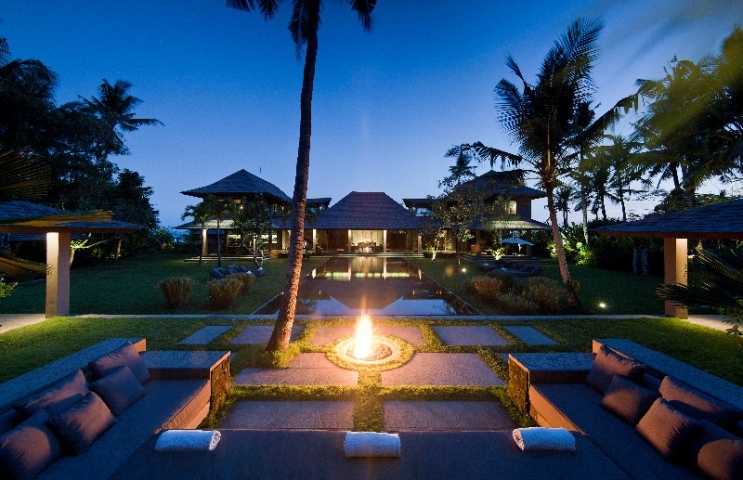 Watch the local fisherman haul in their daily catch, and the village children play football at dusk. 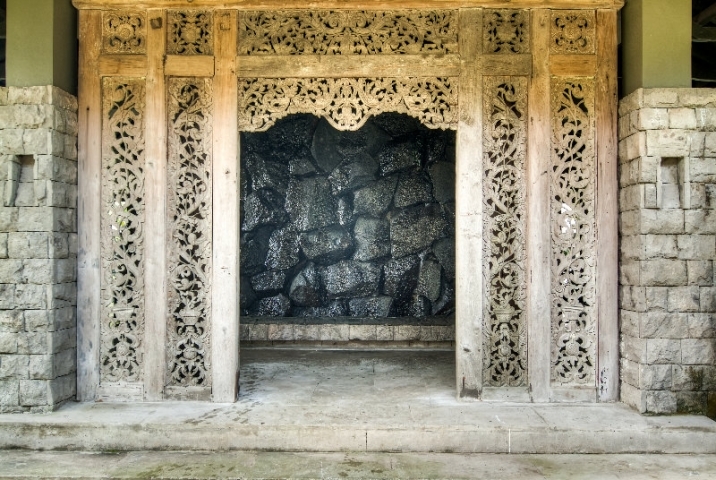 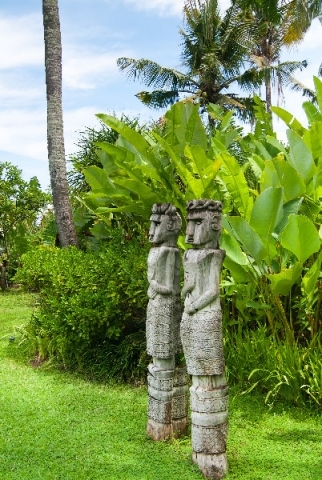 Or wander to the local temple where enchanting ceremonies are performed daily against the ocean backdrop. 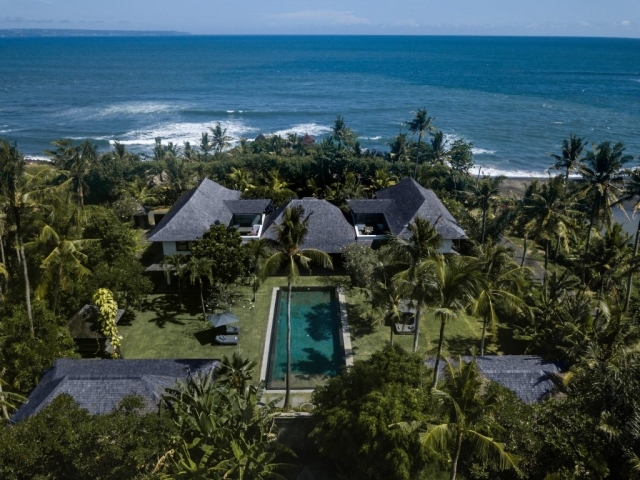 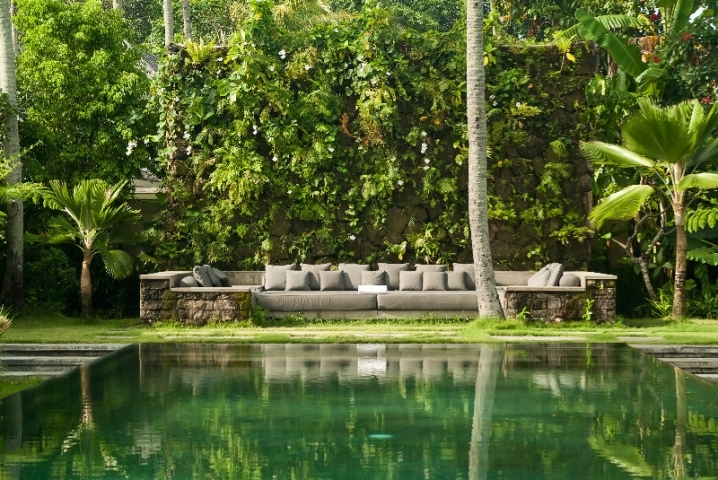 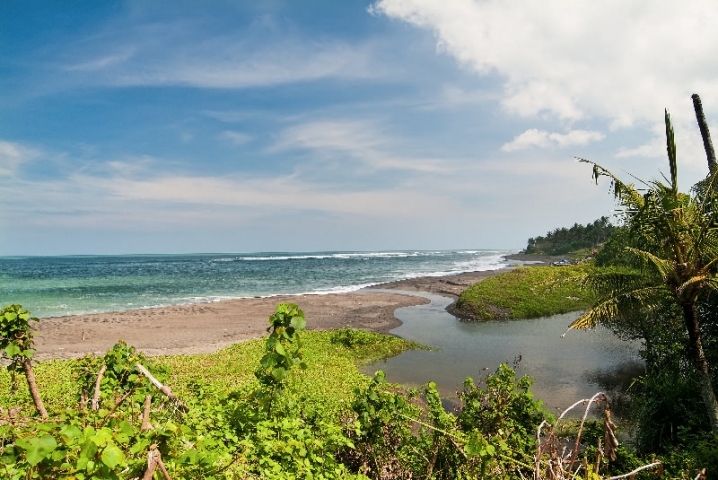 For adventure further afield, with car and driver within twenty minutes you could be dining at one of Seminyak’s world class restaurants, shopping at boutique, or teeing off on the world renowned Nirwana Bali Golf course. 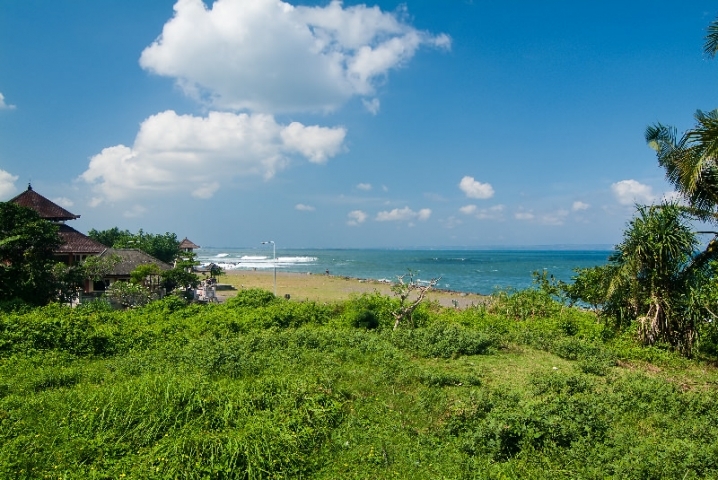 High season: Chinese NY, Easter week, April 27 - May 5, June 1 - September 1. 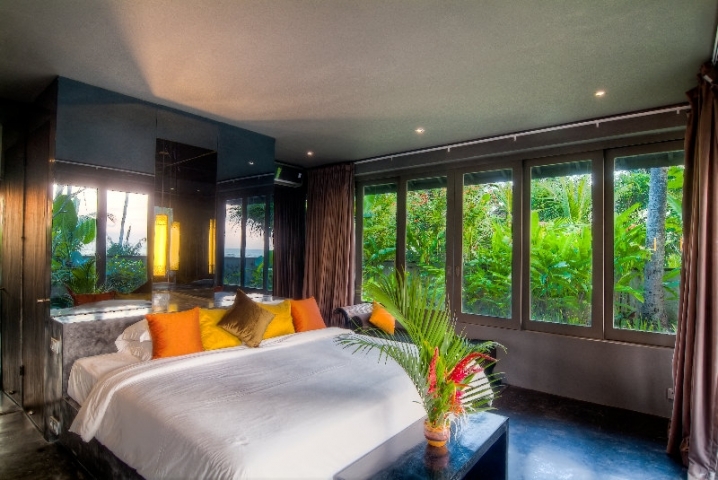 Full payment is required 60 days before check-in.